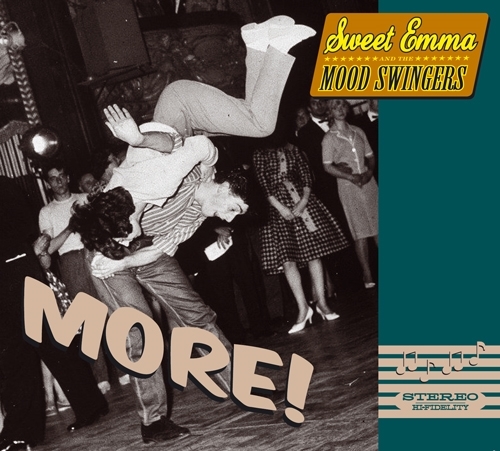 Sweet Emma And The Mood Swingers - MORE! Sweet Emma & The Mood Swingers are not afraid off any type of music. They are blending swing, r n´b and blues and are simply playing the music that they like without getting stuck in any genre. Their aim is basicly to make people have a great night out both on the dance floor and when sippin´cocktails in the bar. The debut album from Emma and The Mood Swingers, More contains a sweet mix between rhythm´n´blues and swing. The arrangements and interpretations of the old music are awesome. Dancers cheer at it. This is really dance music. Emma and The Mood Swingers have their own, genuine sound with the authentic retro feel with a modern side to it. Seeing the band live you get smithen by their overflowing joy on stage Emma and The Mood Swingers express. Out of the 13 cuts on More 4 are written by the band.